A charming museum that also lets you wander through typical old houses. 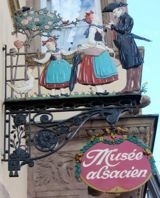 The Alsatian Museum, located on the Quai St. Nicolas, just across the Pont du Corbeau, houses a wonderful collection of folk art. You can visit with a free audioguide or with a written guide. Established in 1907, the museum occupies three lovely Renaissance houses, all connected. Going from room to room and level to level within the house is almost as interesting as the collections! 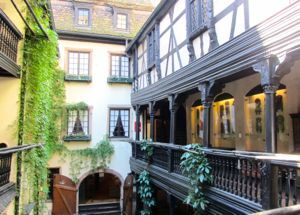 You'll go up stairs, down corridors, out on the balcony, back around—just follow the "sens de la visite" signs and you'll wind your way through the houses—about 30 rooms in all. You'll see exhibits of portions of old homes, with hand painted walls; examples of various forms of stoves, many with lovely decoration; typical bedrooms and kitchens, with their furnishings; and much more. Traditional clothing gives a feedling for weddings, funerals, and daily life, while 19th century ceramics illustrate the origins of the casserole dishes and plates you'll see in modern souvenir shops. A small farm house is reproduced, showing the kitchen and bedrooms and typical furnishings. You can use your Strasbourg Pass for free or reduced admission. 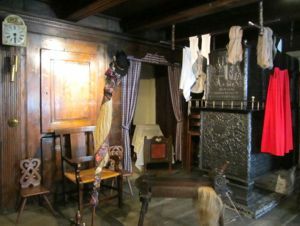 Above, Typical farmhouse kitchen and bedroom, Alsatian Museum. Below, Many balconies and corridors to explore in this museum!